The attached plate is owned by a neighbor. it is damaged and was found in an old stable adjacent to a house that was built in the 1700s. 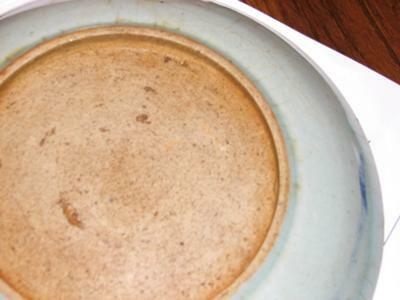 It is Cobalt Blue and Grey Stoneware with what appears to be a KOI (Carp) design. The back has initials O or D, with an L below it, and also has another design -- mouse or ?? which is hard to discern. Any insight on maker, age, value, repair costs if feasible, would be welcome. Trying to help the neighbor obtain some information. 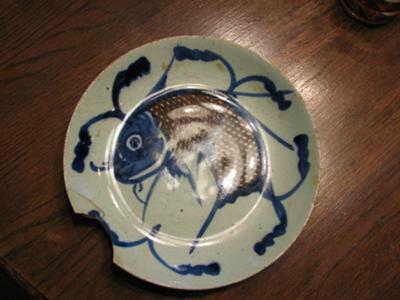 This fish plate is a still very common antique from the 19th century. Due to its simple design and large numbers still in existence it won't have any high value.